There’s a certain trick that smart game designers use to mess with their players. You’ll finish a level, all satisfied and cocky about it, and then the next stage will look exactly the same, with a twist. Maybe it’s missing the crate that was the lynchpin of your first strategy, or maybe there’s an extra enemy blocking the path. “Ha, you thought you were better than me,” declares the game. “You are not.” Baba Is You is the master of this design trick. The more you play Baba Is You, the more you learn that it’s all about experimenting, breaking, and subverting your expectations in every possible way. You might think you’ve come up with a clever solution to a puzzle only to find that there’s a rule in your way, like “Door Is Door,” which prevents doors from transforming into other objects. Sometimes you can only win by changing who you control, sometimes you can only win with precise movement, and sometimes you can only win by twisting your brain around like a pretzel in hopes that somehow, in some way, the answer will pop out. As you keep playing, you’ll discover new rules and objects. For example, one set of stages features the word All, and if you want to cause complete chaos, try seeing what happens when you declare that All Is You. (Spoiler: You’ll suddenly find yourself in control of every object on the screen.) Words like And and Has add all sorts of new possibilities to the potential rule set, which makes puzzles exponentially more complicated. If “Baba Has Baba,” then every time you die, you’ll drop yourself. How’s that for recursion? 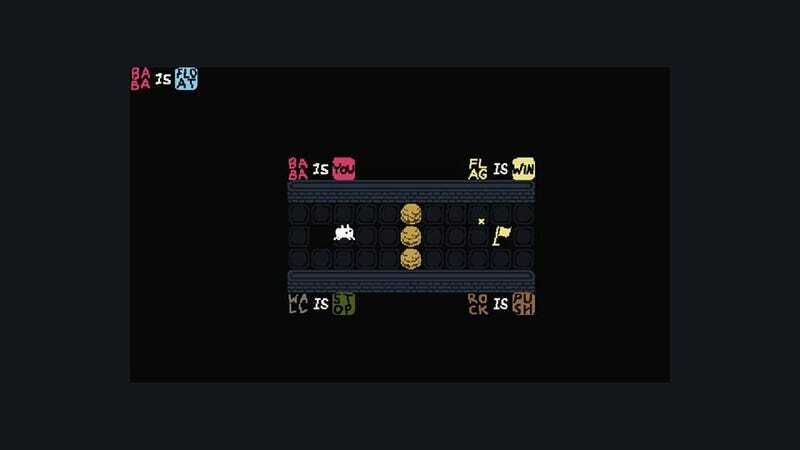 Few games are as good at making me simultaneously feel like both a genius and the biggest idiot in the world, which is why I’m absolutely enamored of Baba Is You. It’s adorable, ingenious, and 100% worth your time. It’s a game where you fight crabs, push walls, and sometimes fight your way through mazes of doors. ...only to find that the next level is the same exact thing except there’s a GODDAMN JELLYFISH blocking your path.